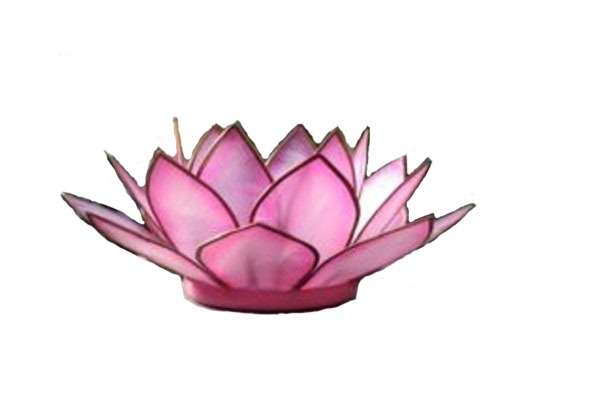 Each Paradise tea light holder is designed in the shape of an open lotus flower, with three rings of translucent capiz shell petals. 5" from tip to tip, 2" high. Each shell is painted only around the edges, creating a unique interplay of light and color. Base is painted same color as shell, brass edge strips are neutral. Use with wax, battery-powered tea light, or small votive candle. These tea lights are handmade in the Philippines and are 100% Fair Trade products. In an effort to support local communities $1 from each lamp purchase helps fund education opportunities for our artisans, workers, and their families. In addition $1 from every purchase funds education opportunities locally and throughout the U.S.